Justice Available? Kasey Grant Killed, Teen Injured in Helena-West Helena Gas Station Shooting. Did negligent security contribute to this tragic loss of life and are justice and compensation available to Mr. Grant’s family? Gunfire erupted outside a Helena-West Helena gas station Tuesday morning, January 22, 2019, claiming the life 25-year-old Kasey Grant and leaving a teenage boy injured. 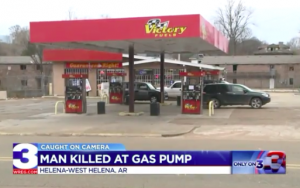 According to WREG 3, Mr. Grant and his teenage passenger were shot “as they sat parked at a gas pump at the Victory Fuels gas station in the 500 block of Columbia,” around 7:30 a.m. Mr. Grant was taken to Helena Regional Medical Center, where he succumbed to fatal injuries. Police told FOX 13, the 17-year-old victim was transported to the hospital with “non-critical” injuries. Gas station patrons have a right to feel safe and secure while on the premises. The Murray Law Firm questions the level of security provided at the gas station and whether this tragedy may have been prevented. What security measures, such as bright lighting, monitored surveillance cameras, clear windows, and visible security personnel, were in place to deter crime and protect Mr. Grant and the surviving victim at the time of the shooting? Generally, property owners are required to protect all those legally on the premises from any foreseeable harm. Should the facts of this matter reveal that the gas station owner failed to provide adequate security to protect those on its premises, Kasey Grant’s family may seek justice and elect to pursue legal claims for their loss. Additionally, the surviving young victim may pursue legal claims for his injuries.